Sleek and low profile, the WeatherTech Easy-On Stone & Bug Deflector is aerodynamically designed to provide excellent protection against stone chips and bug stains. Made from aerospace-grade acrylic, it is virtually indestructible and extremely scratch resistant. 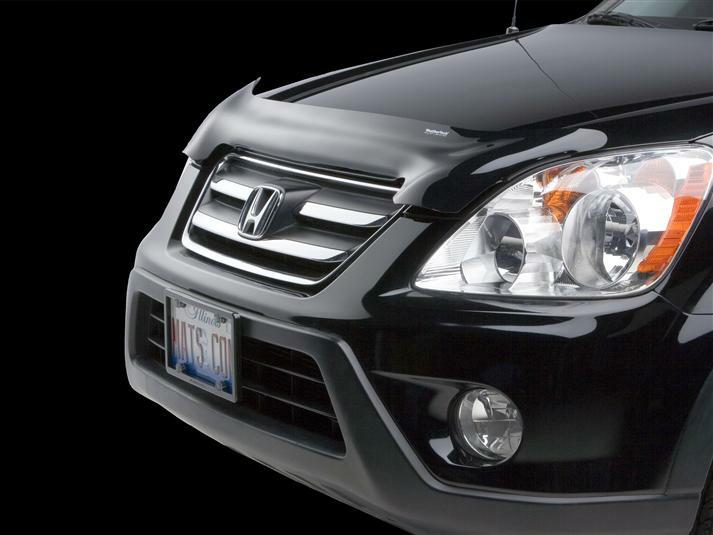 Attaches easily to most SUVs, trucks, minivans or cars using either a 3M brand automotive adhesive tape or fasteners that use existing holes in your 2002 Honda CR-V's hood. No drilling is required. A beautiful and protective addition to any vehicle. On October 10, 2007 my 03 Honda CR-V was struck by another vehicle running a very red light.Though the front of my suv was destroyed and my hood badly bent, your stone & bug deflector showed no sign of damage. Before trading I removed it and will be installing it, along with the side window deflectors, on my wife's 06 CR-V come warmer weather. I love your products and look forward to outfitting my 08 GMC Canyon. What I love about your products is that you always keep up with the latest models and the price is competitive. Also, the design is sleek and different than the competitors. Good quality. I installed the deflector before a road trip to virginia, very easy to put on. the product works great, less dirt and debree on windshild.